There is a huge variety of circuit training equipment that is in use nowadays compared to that which was available when circuit training was first designed. Circuit training is widely used in many sports to develop general fitness. Nevertheless, if you have been participating in your sport for any length of time, and you are still doing those same routines, your body will become accustomed to the same exercise stimulus. When this happens, your body will cease adapting to training. So, how can you practice the circuit training methodology yet provide the variety of stimulus that keeps the body adapting to change? Well, a simple change of a single piece of circuit training equipment is sometimes all that is required to force the body to adapt differently. The type of training equipment you choose will depend largely on your training objectives, space and to some extent the budget you have at your disposal. With respect to the last point, circuit training equipment can be as inexpensive or as costly as you want them to be. The most inexpensive piece of equipment, of course, is you! By that I mean your bodyweight and with just your bodyweight as the resistance, you can manipulate the exercise duration, rhythm and rest periods to accomplish almost any training objective you require. However, if you have graduated from body weight circuits, then you will need some additional props that will progressively stress your cardiovascular and musculoskeletal system and force an adaptation. The following are some circuit training equipment you can consider for use. Swiss balls are also known by other names such as an exercise ball or physio ball. Regardless of what you may call this piece of exercise equipment, they are a good addition to your circuit training routine. Due to their construction (round and pliable) Swiss balls can make the performance of some exercises extremely difficult. And that is a perfect way of providing an overload to your training. Now, you may think that skipping is an activity performed by children (and mostly by girls at that) and in a sense you would be right. But do you know that skipping can be considered a cardiovascular activity with the ability to consume as many calories as an aerobic run or bike riding? With a jump frequency rate of 1-2 cycles per second and at a cost of 1 calorie per cycle, that’s about 7000 calories per hour – that’s pretty impressive. You can incorporate weights into skipping ropes, and so increase the difficulty of the exercise. Add this activity to your circuit training workout and be prepared for the difference it will make. The dumbbell might be considered a form of free weight equipment. However, it differs from free weights in that they are only hand held weights, and loads can begin from as little as 2lbs (1kg). The dumbbell as one your circuit training equipment props can increase the overload and intensity of many upper body exercises and depending on the weight of the dumbbell, even lower body exercises can benefit as well. Due to their versatility dumbbells can be used any number of ways. A medicine ball is a weighted ball. Going back fifteen to twenty years they were made of stitched leather and filled with sand, nowadays they are usually made from durable, moulded rubber. Medicine balls are available in a variety of sizes and weights. They are usually used in performance training to develop upper and lower body power. 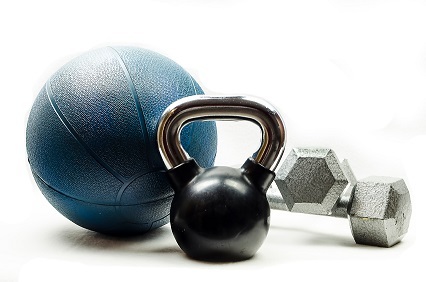 However, their availability in a variety of weights makes medicine balls a perfect piece of circuit training equipment especially where you have a large group of participants each with differing ability. You can provide each participant with a ball that matches their ability to perform the exercise with good form. To take your circuit training up a notch, power-bags is a must especially for exercises that involve the lower extremities. Similar to Bulgarian bags, you can use power bags for a variety of movement and fitness objectives. Normally, power bags are made from canvas filled with sand. You can fit handles at either end of the bag as a means to gripping the bag, and like medicine balls, they are available in a variety of sizes and weights. The weight of a power bag however, will begin at around 10kgs and can go up to as high as 50kgs. You can adapt almost any of your circuit training exercises to a power bag workout. So, there you have it, five examples of circuit training equipment that will help you to progress your workouts and keep your fitness levels moving in the right direction. Have fun! From "5 Circuit Training Equipment You Must Use" Back To "Faster, Stronger, Better – Your Shortcut To Improved Athletic Performance"